I live in the Mission Beach area of San Diego, California. It’s a bit different from Michigan, especially in the wintertime, and I was desperately trying to get back there after my conference with the Jims. There are no direct flights from Grand Rapids to San Diego International Airport, unless you had enough cake to hire your own personal jet, which, of course, I didn’t. I was prowling the sleek metal and glass halls of O’Hare and killing time as I waited for my connection, which was delayed for an unspecified amount of time. I had ignored the gate agent’s admonishment to “remain comfortably seated in the boarding area” in case the weather gods suddenly changed their game plan. The airline was having enough trouble negotiating their pilot contracts let alone getting cooperation from the supreme powers that be, so I bugged out to wander the concourse and pump a little blood into my travel weary brain cells. 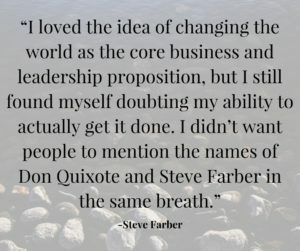 and Steve Farber in the same breath. Tilting unabashedly at windmills is one thing; slaying dragons is a whole ’nother smoke. I turned a corner and found myself face to face with a large and very odd billboard advertisement. It was a picture of a blue Oxford button-down shirt with a red power necktie, and it would have been the classic image of clean, conservative business, if not for one bizarre detail: the tie was on fire. Accompanying it was a big, bold headline that read, “Burn Your Boss” and a tagline at the bottom that said, “Report the use of unlicensed software.” This was, essentially, an invitation—no, a challenge—for a person to spy on and rat out their management, and it was punctuated with an 800 number hotline for people to call right now and strike the sparkling, gratifying match of revenge. Now I have as much respect for intellectual property rights as the next guy. Probably more. I’m not a fan of pirating or plagiarism. I sided with Metallica over the early Napster debates and will gladly pop for a buck a song to download to my iPod as opposed to trolling the web for free sources. Software’s in the same category, especially on an enterprise level. However, “Burn Your Boss?” Have things really gotten that bad? Did these people honestly expect to tap into some unexpressed reservoir of rage trembling under the surface of other business travelers like myself? More importantly, was this ad working? There was one way to find out. I called the number. I shoveled the gobs of mail from my box, punched in the security code on the front door, and climbed the two flights of stairs to my apartment overlooking Mission Bay. It was always strange to return home to an empty perch and see how much dust had managed to accumulate on the kitchen counters in just one week. The sea air mixed with fine sand always found its way in with or without the security code. Here in the 21st century, the archetypal call to action mostly comes via the digital phone. Jack, I thought wistfully, would have to wait in his box a little bit longer. Independence Lending Group, Inc.’s (ILGI) snappy commercials promising the best mortgage rates and fastest service on the planet were plastered all over the television and radio airwaves. Maybe they were true; all I knew was that the company had grown like gangbusters during the nuclear boom in the real estate market and the feverish refi activity fueled by subterranean interest rates. I’m usually not impressed by people who make fortunes in bull markets, even though, come to think of it, I never have, but this was one of the few mortgage companies that also managed to survive the subsequent economic meltdown. And that was noteworthy. ILGI’s corporate offices were in La Jolla’s University Town Center (UTC) neighborhood. UTC is a cement and glass amalgam of apartments, office buildings, malls, restaurants, and a Mormon temple that keeps an impressive and watchful eye over the endless traffic on Interstate 5. I parked my Mustang in the visitor’s parking structure and took the elevator up to the 18th floor. The receptionist announced my name into the phone, and before I had a chance to settle into a plush leather chair, Rich Delacroix came bounding through the door on the far end of the waiting area. He was young—mid 30s, I guessed—tan, fit, blond, energetic and, although his attire was casual, exceedingly well dressed. Despite all that, I liked him immediately. It was really rather endearing to see this supremely self-possessed individual squirm as if he had a tapeworm. This was not a dude who was used to asking anyone for help, let alone a virtual stranger.